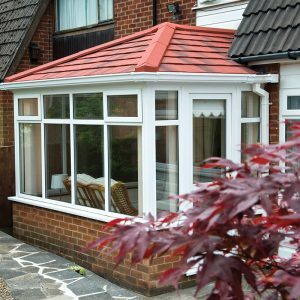 Whilst tiled roofs are suitable for new conservatory installations, they can also be used to replace existing glass or polycarbonate roofing. However, you may be asking yourself why would I want tiled roofing as opposed to polycarbonate? Well, there’s plenty of reasons why, and we’ve covered a number of them below. When it’s raining – which happens a lot in England as I’m sure you know! – the sound of rain hitting a polycarbonate roof is clearly audible. However, this isn’t the case with tiled roofs; the sound of rain hitting them is almost entirely eliminated, leaving you with a peaceful environment in which to relax. One common problem with polycarbonate roofing is that large amounts of heat are lost through it, leading to cold conservatories come winter time. However, tiled roofs retain an exceptional amount of warmth, ensuring you needn’t worry about wrapping up or spending excessive amounts of cash to heat your conservatory during the colder months. Tiled roof conservatories are also much cooler in the summer than polycarbonate variants, meaning they provide you with a space that maintains a comfortable temperate right the year round. Because of their ability to maintain a comfortable temperature throughout the year, tiled roof conservatories can be used for a wider variety of purposes. Conversely, polycarbonate roof conservatories require their use dictating in line with the seasons. That is unless you mind being too hot or too cold! Due to their relative transparency, polycarbonate roofs regularly cause homeowners to suffer from glare. However, tiled roof conservatories significantly reduce its impact, so you needn’t worry about bringing your sunglasses when venturing into the conservatory. 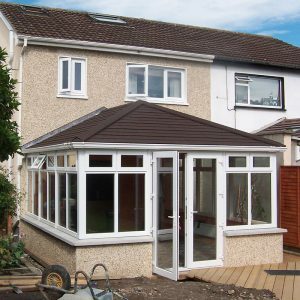 Unless the roof on your home is polycarbonate, your conservatory’s roof is unlikely to match it. However, tiled roofing is available in a selection of colours, whilst a range of stylish slate tiles, similar to traditional slate roofing, are also available. This ensures they’re able to effortlessly match the roofing on your home. Tiled roof conservatories feature an interior plastered ceiling, which comes fitted with a number of spotlights. This ensures they feel more like an additional room, as opposed to a separate part, of your home. If you’re interested in a tiled roof conservatory for your home, Associated Windows can help; our team is highly experienced fitting them on new or existing conservatory structures. However, we can fit glass roofs too. For more information, contact us on 0117 931177 or send us a message online.